Mains - BBQ- Grill There are 7 products to choose from. Takeaway Lanzarote - Restaurants Playa Blanca Best Delivery Steak Restaurants Playa Blanca - Food Delivery Service across Canarias from Best Steak Restaurants with Delivery Takeaways. 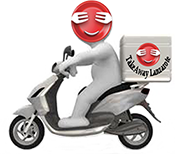 Takeaway Lanzarote - Restaurants Playa Blanca Food delivery Playa Blanca from most Recommended Steak Restaurants with Delivery - Order your Favorite Takeout Meals Online on over the phone calling 0034 691 555 161. Takeaway Lanzarote - Restaurants Playa Blanca This dish gives you a taste of all our best meats. Takeaway Lanzarote - Restaurants Playa Blanca Served with chedder cheese , lettuce , tomato and onion.